How an obscure toy maker was transformed into Hanergy Thin Film, a solar group whose value touched $40bn before a dramatic fall back to earthSix years ago even the most bullish brokers would have struggled to get excited about the stock that traded under the ticker “566” on the Hong Kong exchange. Even as foreign investors were desperate to invest in China’s booming economy, RBI Holdings held little appeal: it was a lossmaking plastic toy company whose products included a Spanish-speaking educational robot. By 2012, “566” had transformed. Toy robots were out. Now selling solar panel equipment, the company was striking big deals with a little-known mainland Chinese businessman, Li Hejun and his Hanergy Group. Three years later, the stock ticker for an unloved toymaker exploded into one of the most valuable companies on the Hong Kong market with a value of $40bn, turning Mr Li into China’s wealthiest paper billionaire. But today Hanergy Thin Film Power’s shares are suspended and will remain so as long as Hong Kong’s market regulator — which this month formally ordered the exchange to halt HTF trading — probes its business model. Mr Li, who lost more than half his fortune in just an hour of trading when HTF shares tumbled in May, has become a symbol of the brutal sell-off in Chinese shares that has sent tremors through global markets. The rise and fall of Mr Li and Hanergy has also shed light on the shadowy corners of Hong Kong’s stock market, where hundreds of small listings quietly change their names and business models overnight, their share prices surging and falling in silence. For mainland Chinese entrepreneurs, who have long needed ways to invest — or hide — their earnings, the Hong Kong market has provided a route not just to riches, but to foreign-denominated capital that can be parked in tax havens such as the British Virgin Islands. As investigators try to understand how a failing toy maker briefly became Hong Kong’s biggest corporate success story, a good place to start is a squat building far from Hong Kong’s glitzy centre. The Town Health Technology Centre, an office block in the bustling Shatin neighbourhood, was where “566” began its metamorphosis in 2010. There it joined a handful of small listed companies — selling everything from healthcare products to financial services to software — some of which have bought and sold each other’s shares, provided each other with loans and swapped senior executives. The complexity of such deals, and the motives behind them, have frequently baffled foreign investors. “It is possible the Hong Kong market and the tiny companies listed there provide shelter for fraud and/or questionable transactions because of the inability to enforce rules [governing] cross holdings and related party transactions that are used to disguise or falsify dishonest or fabricated money flows,” says Rod Sutton, an insolvency specialist at FTI Consulting in Hong Kong. Of the dozens of directors who have worked at companies registered at the Town Health Technology Centre, one personality stands out. Ronnie Hui is the chief executive of Town Health International Medical Group, the owner of the office block. Until last year, he was chief executive and then finance director of Hanergy Thin Film. The silver-haired Dr Hui, a trained paediatrician active in political parties loyal to Beijing, has over the past decade been an executive or director at 10 Hong Kong companies — some of them based at Town Health Technology Centre. The companies he has chosen to work with have been exciting ones. In addition to Hanergy Thin Film — whose share price more than doubled during his time there — several other companies where Dr Hui served as a director saw dazzling increases and subsequent drops in market value. The turbulence of his companies’ shares was not his concern, either. “Investors have to take the risk on buying and owning stocks. They can hold me accountable for how the business is operated but they can’t hold me accountable for the share price behaviour,” he says. The connections his nascent solar company made with the Town Health Technology Centre companies were to prove useful to the unknown tycoon. One company based out of the Town Health Technology Centre provided a loan worth millions of dollars to Hanergy Group, holding Mr Li’s stock as collateral. The company has changed its name seven times in 15 years but is now known as Jun Yang Solar. Yet despite the frequent name changes, it has always traded under the ticker “397”. Dr Hui was the executive director of the “397” listing between 2007 and 2009 when it was called Hong Kong Health Check, a provider of medical diagnostic services. He left before the company changed its name to China GoGreen to focus on solar power. As Mr Li built his stake in the Hong Kong ticker “566”, the former toy maker, Dr Hui was named chief executive. Within months “566” took up an address at the Town Health Technology Centre, and began its transformation into Hanergy Thin Film. Dr Hui’s new company now not only shared an office with his old employers at “397”, but also began to enter into commercial transactions with other companies based there. China GoGreen was one of the main customers of “566”. At one stage Hanergy Thin Film purchased a stake in “397”, which was by then called Jun Yang Solar, before going on to sell the shares at a loss. Later, in 2013, Mr Li’s Hanergy Group took out a high-interest HK$120m loan from Jun Yang Solar, which by this point had decided to diversify beyond solar power and become a money lender. But why were Mr Li and Hanergy Thin Film choosing to swap shares and borrow money at high interest rates from a small Hong Kong listed company which, under a different name, had once employed his finance director, Dr Hui? Dr Hui says that he did not know the reason behind the deals, and that they were struck by Frank Dai, Li Hejun’s right-hand man who was closer to the Chinese tycoon in Beijing. “You have to ask him because I have no idea,” Dr Hui said. Mr Dai declined to comment. Several of the Hong Kong-listed companies at Town Health Technology Centre — including the “566” listing that grew into Mr Li’s Hanergy Thin Film — have worked with Kingston Financial, a financial services company led by Macau casino owner Pollyanna Chu. Ms Chu and Kingston have at different times been significant shareholders in listings connected to the Technology Centre, as well as working as placement agents to sell their shares to investors. Kingston’s brokerage arm has also held large amounts of these companies’ shares in recent years. Ms Chu is one of the richest people in Hong Kong and has built a chequered reputation for herself and Kingston in the Hong Kong market. She was sanctioned in 2003 by the Hong Kong regulator after an investigation into manipulative trading in derivative warrants. In May, Kingston was fined HK$500,000 ($65,000) by the regulator for “fitness and properness” concerns linked to accounts in Macau. The links between Hanergy Thin Film and companies connected to the Town Health Technology Centre and its owner have continued for years. Like Jun Yang, China Natural Resources changed its name and business model numerous times, switching from pharmaceuticals to public relations and — most recently — to trading and processing minerals. While China Natural was not registered to the Town Health Technology Centre, it shared multiple directors with companies based there, including Dr Hui, who worked at the listing when it had another name between 2007 and 2009. Including Dr Hui, two of China Natural’s former directors have worked as directors at Town Health International Medical Group, and two at Jun Yang. One former director also served on the board of RBI Holdings, the toy maker that became Hanergy Thin Film. Another ex-China Natural director, Wu Mei Chu, once owned E Finance, which went on to lend to Hanergy Group. China Natural also owns a public relations company, PR Asia, whose client list includes Hanergy Thin Film, Town Health, an earlier incarnation of Jun Yang Solar and China Natural itself. Kingston Financial is a PR client of China Natural — and also holds 35 per cent of its shares in its capacity as a broker, according to Hong Kong clearing data. 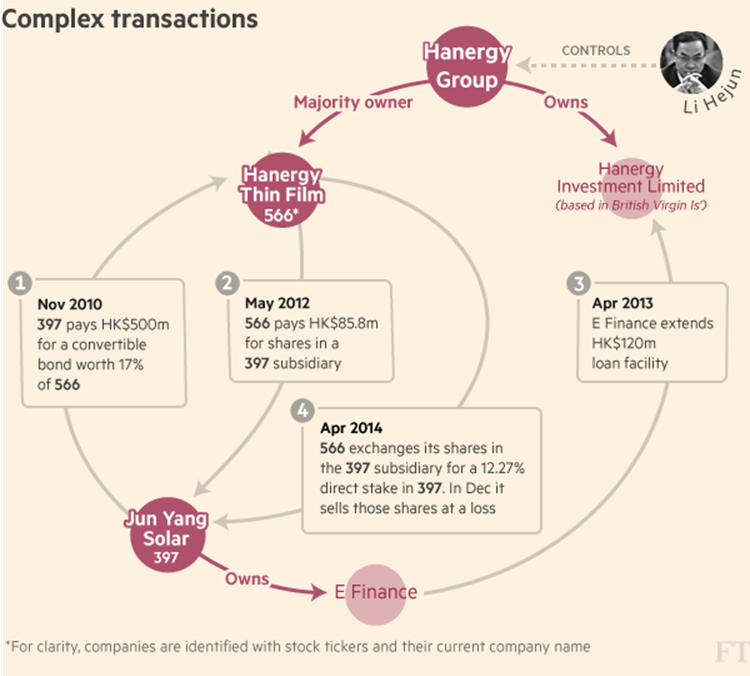 As Hanergy Thin Film shares surged, Mr Li took out large loans by pledging his own shares in the company as collateral. In March 2015, when Mr Li wanted to enter into a sale and leaseback agreement for one of his Gulfstream private jets, he sold it to Noble Century Investment Holdings, a Hong Kong listed company worth less than $100m whose other major asset is a bulk cargo ship. Noble Century’s chief executive at the time of the deal, Chan Chi Yuen, has served as a director at ticker “397” since 2005. Kenneth Chi Hung-chi, one of three independent directors at Noble Century, served as chairman of “397” between 2003 and 2007, and is also an independent director of China Natural Resources. Both have served on the board of Kingston Financial. Mr Li’s rapid rise and fall has come to symbolise the top of a market in China and Hong Kong that had become dangerously overheated. In the weeks since its crash, some news outlets have asked whether Hanergy Thin Film is “China’s Enron” but Mr Li maintains that the business remains healthy. However, some of its largest private investors have sold out in off-exchange deals at a hefty loss. Those who lent Mr Li money in exchange for shares face seeing their collateral lose value. HTF said yesterday it would cancel a $2.2bn “arm’s length” three-year agreement to buy solar panels from its parent company. Yet Dr Hui remains sanguine about his ties to a company that has suffered one of Hong Kong’s biggest market collapses. He sees himself continuing a career as a serial company executive.